First they closed the doors and turned out the lights on the Camden, New Jersey Police Dept. 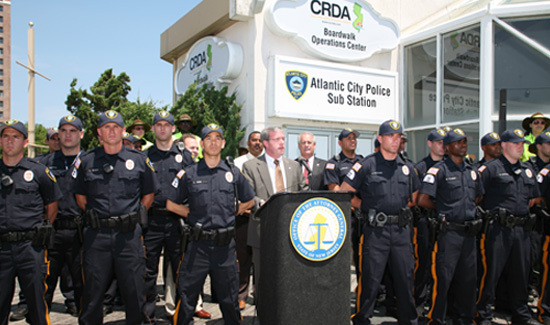 Observers say it’s looking like the Atlantic City PD is next on the chopping block. On the surface there doesn’t seem to be much of a connection between insurance, something like a defined benefit program, and fully budgeted and staffed law enforcement agency. But in a way, spending public money to hire personnel and fund public safety operations is a kind of insurance policy. For instance, when crime is down there will obviously be calls for cities and counties to cut back on police officers and agency budgets. If those wild bets pay off, great. If they fail, and they usually do, someone gets left holding the bag. The results are as plain as day. Elected officials and their gambling addiction are the primary reason Detroit and Central Falls, Rhode Island are bankrupt and why some of the country’s most dangerous cities, like Camden, New Jersey have laid off as many as half the cops that used to work there. Surely not the members of the political and financial classes that cut corners, played fast and loose with others people’s money and made all kinds of shady back room deals in smoky rooms. Just ask the professional pundits of the corporate media and the “job creators.” They’ll tell you it’s the union-thugs and their golden parachutes that are to blame. It’s total nonsense of course. But you can get a lot of people to believe anything if you pay to have them told something over and over. So the financial and political classes made a bet. With crime down and an effective PR campaign to make pensioners evil incarnate they figured they could cut budgets to the bone. As long as the economy was stable and crime rates remained at historical lows they’d never have to pay the piper. Well guess what? The economy is crap and crime’s making a U-turn. So when law enforcement officials are asked why they seemingly can’t handle climbing rates of crime the biggest mistake they could make would be standing in for the people actually responsible for the mess. Forget the “we’ll just have to do more with less,” routine. In this case honesty is actually the best policy. When cash-strapped agencies start getting bad press because they can’t really do more with less, it’s up to law enforcement leaders to identify the culprits. The only question is whether they’re up to the task.